Cleo Coyle is just one pseudonym for this author, who also writes as Alice Kimberly . 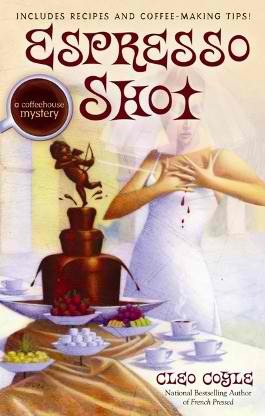 Espresso Shot is the seventh book in Cleo Coyle's Coffeehouse series featuring main heroine and barista Clare Cosi. Just days away from when the elite, beautiful, and successful Breanne Summour is about to marry Clare's ex-husband Matteo Allegro, people close to Breanne are starting to wind up dead. Out of concern for her daughter's father and business partner, Clare hones in on her inner-sleuth and begins to investigate the crimes, coming to think that perhaps Breanne is not that great of a match for Matt after all. Clare better be careful though, because the closer she gets to uncovering the identity of the murderer, the closer death comes to knocking on her own door. All of Coyle's Coffeehouse books are pure fun; you can't help but salivate for coffee and espresso and all the numerous other yummy recipes Coyle features in her books as you're reading. For readers who have read the previous books in the series, you'll enjoy the rapport between all the characters that just continues to build in Espresso Shot . We're also left hanging on a thread throughout the entire book on whether Matteo will actually go through with marrying Breanne at the end (unless she's incriminated) -- or will he continue to pine after Clare? Espresso Shot will undoubtedly take readers on a fun journey; Clare never fails to amuse us as she continues to experience awkward and uncomfortable mishaps. Despite her sleuthing background with six books behind us, apparently Clare's investigating expertise falls along the lines of "once an amateur, always an amateur". Ha! The result is infinitely entertaining, which is why this series is so popular! Not to mention the coffee factoids and tips that Cleo Coyle sprinkles in each book throughout the series. I'm proud to say I've applied her expertise to my own coffee-making since I began reading the series in 2003. Following Espresso Shot is Holiday Grind (2009), Roast Mortem (2010) and Murder by Mocha , which is due to release August 2011.